Published Sunday, 06 May 2012. A major operation has been taking place near Kilrea in Co Londonderry after a young man, thought to be from the Ballymena area, went missing on Saturday. It was believed he jumped into the water close to the Bann Road Bridge. Police said search crews found a man's body on Sunday afternoon. He was recovered from the water, however formal identification has not yet taken place and a post mortem is due to be carried out shortly. Three men aged 23, 26 and 30 have been arrested in connection with the incident. They remain in police custody and are assisting with inquiries. Police said they want to speak to a group of men who were in the area when the incident took place and were seen leaving in a red coloured car shortly afterwards. Investigations into the circumstances surrounding the incident are continuing. Two "viable" pipe bombs, ammunition and fireworks have been found buried in a Co Antrim forest, police have said. The devices were discovered on Friday night in an area of Portglenone Forest Park. Police said they were found after the PSNI were made aware of suspicious activity in the area. The army bomb squad was called in and the devices were made safe and removed for further examination. Earlier this year, pipe bombs were left at a GAA club in Portglenone, and at another club and catholic primary school in nearby Ahoghill. Loyalists have been blamed for these attacks and the latest find. North Antrim Sinn Féin MLA Daithí McKay has called on people in the area to be vigilant. "This find comes in the wake of a number of pipe bomb attacks in the Portglenone and Ahoghill area targeting GAA clubs and a Catholic Primary School", he said. "What is most concerning about the find is the fact that the pipe bombs are viable devices. "I would appeal for local people to be vigilant in light of this find and I am thankful that they were intercepted before they were used." Police want anyone who may have information to contact them. Were those killed and injured all unarmed and innocent civilians? "None of the casualties shot by soldiers of Support Company was armed with a firearm or (with the probable exception of Gerald Donaghey) a bomb of any description. None was posing any threat of causing death or serious injury. In no case was any warning given before soldiers opened fire. "None of the casualties was posing a threat of causing death or serious injury, or indeed was doing anything else that could on any view justify their shooting." Did the soldiers shoot in response to IRA gunfire? "We have concluded that the explanation for such firing by Support Company soldiers after they had gone into the Bogside was in most cases probably the mistaken belief among them that republican paramilitaries were responding in force to their arrival in the Bogside. This belief was initiated by the first shots fired by Lieutenant N and reinforced by the further shots that followed soon after." causing death or serious injury." Relatives of those killed on Bloody Sunday wanted Lord Saville to give official recognition they were unarmed and innocent civilians, who were unlawfully killed. Were any of those killed or injured carrying weapons? Saville said that none of the victims were armed "with the probable exception of Gerald Donaghy". A police photograph showed nailbombs on Mr Donaghey's body. His family said they were planted - Saville disagreed. But the inquiry added: "We are sure that Gerald Donaghey was not preparing or attempting to throw a nail bomb when he was shot; and we are equally sure that he was not shot because of his possession of the nail bombs. He was shot while trying to escape from the soldiers." Was anyone other than the known dead and wounded shot? Some soldiers have suggested the IRA spirited away their own dead. Saville said there was no evidence that anyone else had been killed on the day - and had they been, the stories would have emerged by now. A key question for the inquiry was whether individual soldiers broke the law. They faced allegations that they either murdered people, fired without justification or gave false evidence. Did the soldiers act in self-defence or did they fire indiscriminately? Saville said the soldiers fired because they lost control. He said with the exception of two soldiers, "none of the firing… was aimed at people posing a threat of causing death or serious injury". Should any soldiers face prosecution - and for what offence? The Saville inquiry has not made any recommendations about prosecutions - but he singles out some of the soldiers, who cannot be named, as people who he says lied to the inquiry or did not care what happened when they opened fire. Soldiers who appeared as witnesses were not granted immunity from prosecution; only immunity from self-incrimination. It is possible that individual soldiers could be prosecuted for their role in Bloody Sunday, but in practice this is highly unlikely. The inquiry also set out to establish what orders were given by army commanders and their superiors in London. Senior officers testified in London, including the soldier in charge of the Parachute Regiment on the day, Colonel Derek Wilford, and the soldier in charge of the whole operation, Brigadier Pat MacLellan. Were the soldiers properly prepared on the day? The report did not criticise Major General Ford, commander of land forces, for deploying soldiers to arrest rioters, but added: "his decision to use 1 Para as the arrest force is open to criticism on the ground that 1 Para was a force with a reputation for using excessive physical violence, which this ran the risk for exacerbating the tensions between the army and nationalists." "The soldiers of Support Company who went into the Bogside did so as the result of an order by Colonel Wilford, which should not have been given and which was contrary to the orders that he had received from Brigadier MacLellan." Did they cover up the events of the day? Saville concludes: "Apart from Private T many of these soldiers have knowingly put forward false accounts in order to seek to justify their firing." Central to the soldiers' explanation of events was the claim that they were responding to IRA gunfire. Martin McGuinness was the most prominent former IRA man to give evidence to the tribunal. Did a republican gunman fire the first shots? Saville says that there was "some firing by republican paramilitaries" but that on balance the Army fired first. A member of the Official IRA told the inquiry that they had shot at soldiers very early on in retaliation to the shooting of two of the protesters. Saville said: "These two Official IRA members had gone to a pre-arranged sniping position in order to fire at the soldiers; and probably did so when an opportunity presented itself rather than because two civilians had been injured." What was the role of Martin McGuinness? engaged in paramilitary activity during the day. there is insufficient evidence to make any finding on this, save that we are sure that he did not engage in any activity that provided any of the soldiers with any justification for opening fire." The shootings happened against a backdrop of worsening violence in Northern Ireland; the march was a protest against internment - a form of imprisonment without trial introduced at the height of the political and civil crisis. Was the government responsible for the deaths? "The immediate responsibility for the deaths and injuries on Bloody Sunday lies with those members of Support Company whose unjustifiable firing was the cause of those deaths and injuries." Did the British government encourage the soldiers to get tough? "In the months before Bloody Sunday, genuine and serious attempts were being made at the highest level [of the British government] to work towards a peaceful political settlement in Northern Ireland. "Any action involving the use or likely use of unwarranted lethal force against nationalists on the occasion of the march (or otherwise) would have been entirely counterproductive to the plans for a peaceful settlement; and was neither contemplated nor foreseen by the United Kingdom Government." Did the Northern Ireland government at Stormont want violence? "So far as the Northern Ireland Government was concerned, although it had been pressing the United Kingdom Government and the Army to step up their efforts to counter republican paramilitaries and to deal with banned marches, we found no evidence that suggested to us that it advocated the use of unwarranted lethal force or was indifferent to its use on the occasion of the march." Was there a shoot-to-kill policy? "It was also submitted that in dealing with the security situation in Northern Ireland generally, the authorities (the United Kingdom and Northern Ireland Governments and the Army) tolerated if not encouraged the use of unjustified lethal force; and that this was the cause or a contributory cause of what happened on Bloody Sunday. We found no evidence of such toleration or encouragement." Antrim footballer Niall McKeever has signed a professional contract with Australian Football League outfit Brisbane Lions and will fly to Australia in November. The 20-year-old was offered a contract last month after impressing in two trials and put pen to paper in his Portglenone home this week. McKeever has joined the Lions on a two-year international rookie contract. 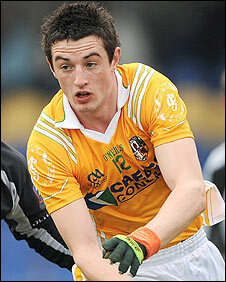 The Saffrons midfielder is expected to play an important role in this Saturday's Ulster SFC game with Cavan. Dissident republicans, the Continuity IRA, have said they murdered a policeman in Northern Ireland. He was Constable Stephen Paul Carroll, 48, a married man with children from the Banbridge area of County Down. He died just 48 hours after two soldiers were shot dead by the Real IRA at an army base in Antrim. Monday night's shooting happened at Lismore Manor, in Craigavon, County Armagh, after a woman called police when her window was broken. Constable Carroll was shot through the rear window of his police car when he arrived at the scene at about 2145 GMT on Monday. Police say they are looking for a man in a light coloured top who was seen running from the area after the shooting. At least two houses have been searched in the nearby Drumbeg estate. At a press conference on Tuesday afternoon, Chief Superintendent Alan Todd said the constable had given 23 years of service to the community, working with the police service. "We have this morning, colleagues without a workmate, a wife without a husband, a son without a father and grandchildren without their grandfather," he said. "It is a desperate loss ... we are working with people to provide safer communities, my question to the people who perpetrated this is 'What have they got to offer?'" The Continuity IRA is one of a number of dissident republican paramilitary groups opposed to the peace process which have carried out bomb and gun attacks on civilians and the security forces. There is believed to be cross-over and co-operation between the Continuity IRA and the larger Real IRA, which bombed Omagh in 1998 killing 29 people and injuring hundreds more. Chief Constable Sir Hugh Orde called it a "sad day" for Northern Ireland's force and said the gunmen were "criminal psychopaths", but said he would not ask for the Army to help patrol NI's streets. "I have no intention to ask the Army for routine military support, it's not necessary and it doesn't work," he said. Sir Hugh held a joint press conference with the first and deputy first ministers Peter Robinson and Martin McGuinness at Stormont. Mr Robinson said: "This is a battle of wills between the political class and the evil gunmen - the political class will win." Mr McGuinness said the dissidents' actions were futile: "These people are traitors to the island of Ireland, they have betrayed the political desires, hopes and aspirations of all of the people who live on this island." Prime Minister Gordon Brown has condemned the murderers and insisted there would be "no return to the old days" in Northern Ireland. Politicians from all parties condemned Monday's killing, which Northern Ireland Secretary Shaun Woodward insisted would not damage the peace process. Asked if the killing was linked to the soldiers' shooting at the weekend, Sir Hugh Orde said: "I think you are giving (the attackers) credit they ill deserve. "I think these are disparate groups, badly infiltrated and indeed many awaiting trial north and south of the border. The first and deputy first ministers have again postponed an investment visit to the US following the murder. In the weekend attack, Sappers Mark Quinsey, 23, from Birmingham and Patrick Azimkar, 21, from London, were shot dead at Massereene Army base, Antrim. The soldiers were killed as they accepted a pizza delivery at about 2120 GMT on Saturday. Four other people, including two pizza delivery men - Anthony Watson, 19, from Antrim, and a Polish man in his 30s - were injured in the attack. One of the men is in a critical condition, another is seriously ill. The biggest danger facing Northern Ireland at the moment is a political and security knock-on effect. The fear is that the killing of two soldiers by the so-called Real IRA could lead to a political chain reaction which sees the collapse of power-sharing at Stormont. At this stage, that seems highly unlikely. The political process appears to be robust enough to withstand the pressure. Prime Minister Gordon Brown's flying visit to Stormont and his meeting with the party leaders helped to unify the politicians, and it looks like the tensions between Sinn Fein and the unionists may ease in the coming days. What is less easy to predict is the security fall-out. The danger is that one deadly attack could lead to another. Rather than lying low after murdering soldiers in Antrim, the dissidents could decide to strike again, to prove that the Army base attack was not just a one-off. That is the nightmare scenario. The police and security services are trying to make sure it does not happen. So are dissident republicans capable of sustaining a full campaign like the Provisional IRA? The police assessment, at this stage, is "no". In an interview in the Belfast Telegraph last month, Assistant Chief Constable Drew Harris gave an insight into the make-up of the dissidents. He said: "They lack public support, they lack finance, they lack personnel and they lack munitions and equipment. "What they can do is sporadic murder, sporadic bombing attacks and, in their terms, be successful in that. "One of the truths about them is that they depend a lot on finance - and their finance is around crime. "A lot of it would be around oil fraud, cigarette fraud? but also now we see crimes of violence such as planning for tiger kidnaps." The Real IRA is not the only republican dissident group involved in violence and crime. It is one of a number of different factions and there is no evidence that they have come together with a central command structure. They seem disinterested in electoral politics. They do not have a political wing which contests elections, and evidently prefer killing to voting. What they do have in common with the Provisional IRA of the 1970s and 1980s is ruthless gunmen, prepared to be involved in mass murder. One of the most chilling aspects of the Antrim shootings was the fact that the gunmen simply shot on sight. The two pizza delivery men were seen as legitimate targets in their eyes, merely because they were supplying take-away food to young squaddies. It harks back to the bad old days of the Troubles when anyone who worked directly or indirectly for the police or Army was targeted. This led to an air of caution in all aspects of life. Children were taught at an early age not to tell anyone what their mother or father did for a living. Anyone with any connection to the security forces looked under their car every morning before going to work, in case a booby-trap device had been planted overnight. It is an old routine which may now be revived by many workers in Northern Ireland in the wake of the Antrim attack. The danger is that people will naturally become more suspicious of others, barriers will be raised rather than broken, and society will become less trusting. It is another potentially damaging domino effect. The coming together of Protestants and Catholics on Sunday in Antrim town centre was a powerful image of cross-community solidarity. The hope is that it was not just a one-off. THE PSNI (Police Service of Northern Ireland) has denied that a gun was waved by officers during an incident in which a car was driven in illegal fashion. Four officers have been suspended and three others moved to other duties following the release last week of video images of a car being driven recklessly. Police are also investigating another case of alleged misconduct. One officer has been arrested and questioned about the illegal possession of firearms. Weapons were found at premises in Aghadowey, Co Derry, last week and in Portglenone, Co Antrim. The officer has been released on bail pending further inquiries. It is understood the weapons involved are a collection of old military-type guns and are not thought to be terrorist-related. Sinn Féin Policing Board member Alex Maskey said the allegations must be dealt with as quickly as possible. “The allegations against these officers are extremely serious, including misuse of a firearm and dangerous and reckless driving,” the West Belfast Assembly member said. “I have been in touch with senior officers to discuss this matter. People will be watching very closely the results of the ongoing PSNI investigation. For reasons of community confidence and good practice it is vital that this investigation is completed quickly and the results . . . made public. Portglenone Fun Day "Big Splash"
They were having a splashing time on the River Bann - despite the inclement weather. Times photographer, John McIlwaine, brave the wet and windy weather to take these shots of the locals. 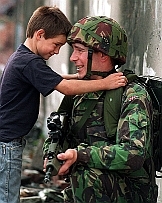 These photos appeared in the Mid Ulster Mail and many other NI local newspapers. They appear to have been taken in July 2007. There are 2 or 3 local Keenans in the photos. To see the slide show, click HERE. Another "Big Splash" will be held on 26 July 2008. 14 July 2008: "Flashpoints averted as parades pass off peacefully"
THE ORANGE Order demonstrations over the Twelfth of July concluded without major incident with the most contentious of the parades at the Ardoyne shops in north Belfast ending peacefully on Saturday night. Throughout Saturday in Northern Ireland tens of thousands of Orangemen, hundreds of bands, and many thousands more supporters participated in 18 Orange Order parades and one Independent Orange Order parade at Portglenone in Co Antrim. Through co-operation with Northern Ireland Tourism and Tourism Ireland, Orange Order leaders laid particular emphasis this year on the "Orangefest" theme - promoting the celebratory, historic and cultural nature of the Twelfth. This emphasis led to some success as there was a noticeable lessening of tension, although there were a number of minor incidents on the night of the 11th and on Saturday. It was also evident that more big stores remained open during the parading. Equally, there were some paramilitary and sectarian references during the main parade in Belfast on Saturday that challenged the Orangefest emphasis. One band from Rathcoole in north Belfast displayed a number of "KAI" signs during the main parade, which is generally interpreted as meaning "kill all Irish", with one bandsman having the word emblazoned on the back of his head. Another band from the Shankill honoured Brian Robinson, the UVF member who was shot dead by an undercover British soldier in north Belfast in 1989 after he carried out the sectarian murder of a Catholic, Patrick McKenna. But relative to the huge numbers participating and observing, the Twelfth concluded successfully. Orange leaders, police and politicians were happy it passed off so well. PSNI assistant chief constable Duncan McCausland said fewer officers were on parade duty this year, which freed up officers to focus on crime and normal policing. In 2005 and 2006 there were scenes of fierce rioting at Ardoyne shops during the return journey of an Orange Order feeder parade. This year local Orange and nationalist representatives forged a deal to try to ensure there would be no trouble at the flashpoint. Nationalists staged a protest as the feeder parade went by on Saturday night. Minutes earlier at 8pm, Orange supporters were driven past the shops on three buses. As they passed two windows were pushed out of two of the buses, the glass shattering on the road. A number of golf balls were also hurled. On Saturday night the PSNI used CS spray when trouble erupted in Rasharkin, Co Antrim. Tensions had been high in the town after an earlier arson attack on the local Orange hall, which followed an attack on a Catholic-owned bar in Rasharkin. On Friday night in Portadown, Co Armagh, 13 PSNI officers were injured, four of them requiring hospital treatment, during disturbances at Obin Street involving nationalists. Two men were arrested. The same night there was also trouble in the New Lodge area of north Belfast when nationalists clashed with police. Two men were arrested. At Broadway in west Belfast police were called in to deal with trouble between loyalists and nationalists. Sinn Féin Assembly member Fra McCann said nationalist residents had "repelled a drunken unionist mob who attempted to attack homes in the area". "If the attack on nationalist homes is evidence of what Orange Order leaders tell us is a new approach to the Twelfth then they have a long way to go to convince people that they are abandoning the usual sectarian behaviour which nationalists have to endure year on year during the marching season," he said. While the Orange Order placed emphasis on the cultural and tourism elements of the Twelfth not all senior Orange figures were happy with this development. The Order's grand chaplain, Rev Stephen Dickinson, rounded on First Minister Peter Robinson for referring to the tourist potential of the occasion at the demonstration in Ballyclare, Co Antrim. Mr Dickinson criticised the DUP for entering into government with Sinn Féin and said Orangemen would not go "down the same route" as the DUP. "This is not about cultural tourism. This is about Protestantism. This is about Britishness. It's not cultural tourism, Mr Robinson," he declared. The DUP in a statement said Mr Dickinson was motivated "by his party political bias as a friend of Jim Allister", leader of the Traditional Unionist Voice that opposes powersharing with Sinn Féin. 12 July 2008: "Orange Order on parade across NI"
Thousands of Orangemen and supporters have been attending the annual Twelfth of July parades in Northern Ireland. The parades mark the 318th anniversary of the battle of the Boyne in which William of Orange defeated King James. The main demonstrations were at 18 venues, with Belfast attracting the most participants and spectators. The Belfast parade left Carlisle Circus at 1000 BST, marching to City Hall for a wreath-laying ceremony and then to the field at Barnett Demesne. There the gathering has been hearing the traditional platform pledges of loyalty to the Protestant faith, the crown and to the union of Great Britain and Northern Ireland. Outside of Belfast, one of the day's largest parades took place in Omagh, where more than 3,000 Orangemen and bandsmen marched through the town. Sixty lodges from the six districts of west Tyrone took part, along with lodges from Larkhill and Airth in Scotland. In County Armagh, more than 5,000 Orangemen marched through Tandragee, while tens of thousands of spectators enjoyed the sounds of 100 Lambeg drums. The largest demonstration in the North West took place in Coleraine, where the gathering heard calls for the symbols of state to be cherished and an end to "attacks on the Protestant sense of Britishness". For the first time in 16 years, more than 5,000 bandsmen and Orangemen paraded through Dromara, County Down. The Independent Loyal Orange Institution, which split from the Grand Lodge of Ireland in 1903, held its demonstration in Portglenone, County Antrim. An alternative way of celebrating the Battle of the Boyne took place at the Irish president's state residence in Dublin where President McAleese held her annual garden party. More than 350 guests from all over Ireland were attending. The entertainment included performances by Irish army pipers, the Band of the King's Division of the British army and the Ballynafeigh School of Irish Dancing. For those who prefer shopping to marching, the number of large retail units opening on the Twelfth has grown considerably this year. Supermarkets, including many Tesco and Asda branches, have remained open for the first time on the Twelfth.